As I drive to work on I-405 in Renton the Osprey Nest next to Mr Racks teased me all winter. The family we watch every day as we drive by and on the LiveStream courtesy Mr Rack is in winter migration to southern climates. They probably went to South America, California or Florida and as spring arrives they too will return to their home nest. I have written a few posts about them over the years which are below for your viewing pleasure. One thing that amazed me from the first time I saw them is how they raise a family right next to a busy freeway, cell tower and power lines. Talk about fearless! The other thing that intrigued me about them was how they originally built on top of the electric pole. The PSE moved them to a nesting platform in 2013. Mr Rack’s who are right next to this nest have so kindly had a video of the nest for several years. They have even improved the camera and worked with the cell tower folks to get a better view. The old camera got pooped on. That is pretty common from my observations of Eagle Cams. That brings me to Monday April 17, 2017. That morning there was one of the pair perched on the nest. I was also happy that Mr Racks has started working on the feed. Watch for more to come on this topic. Got to love our tenacious Freeway Osprey. Here is a link to the 2017 Cam. It has not started but they are getting ready for the action. You can also go view prior seasons. The photo at the top is from their site. Check out the cars whizzing by below. 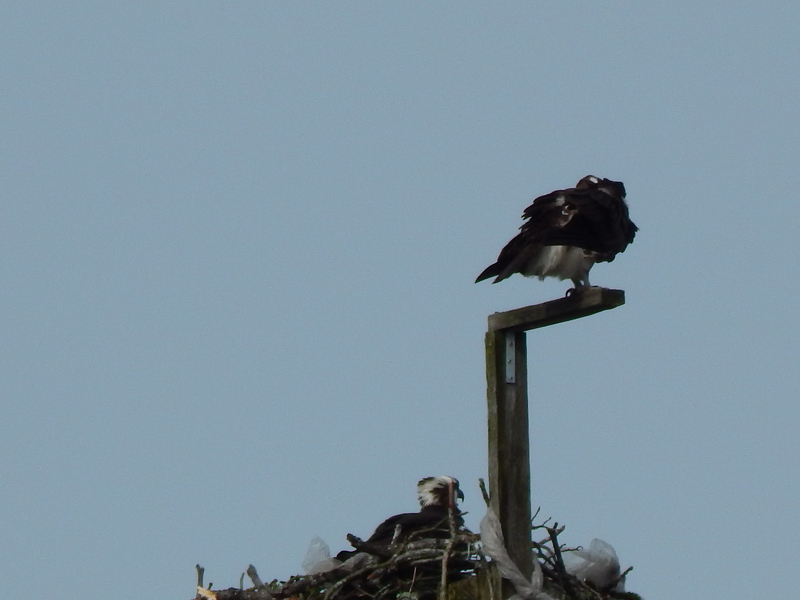 Another family of Osprey have returned home. Last Sunday I went to a new park on the Duwamish close to where the river becomes the Green River. 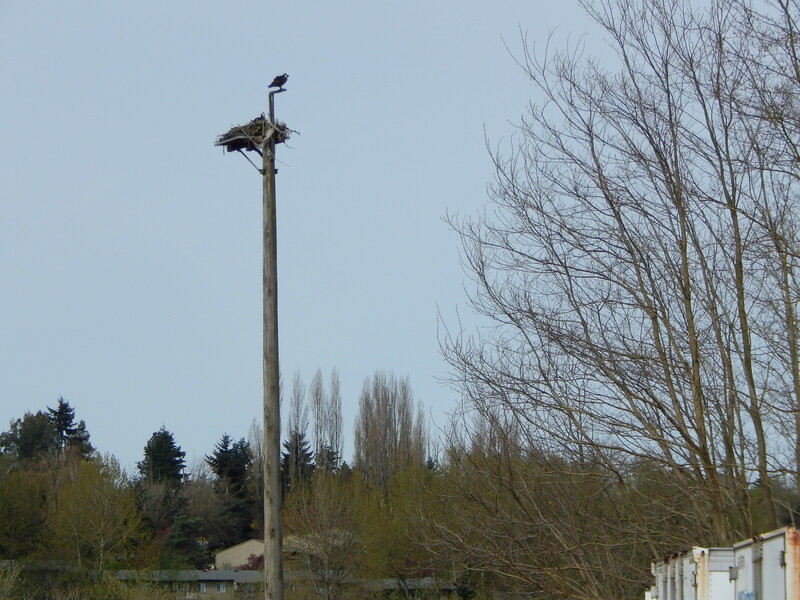 There I found a pair staking out their nesting platform that was situated on the river behind the UPS freight terminal. How about a close up of them preening and getting comfortable for the long sit. This park has a wind chime feature that was near this Osprey nest. I wonder if they are enjoying the tinkle it provides. A nice lullaby for the baby birds to come. I leave you with a few more links to past Osprey posts. Be sure to look for the Freeway Osprey on the south side of I-405 right before you get to the Valley Freeway. Did the I405 Freeway and Duwamish-UPS Osprey raise young this year? Thanks. My observations confirm same. 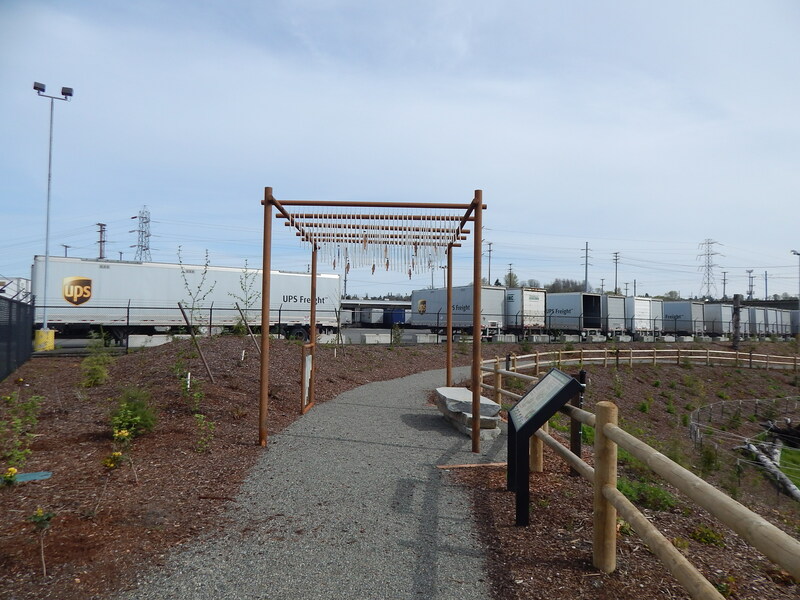 Any nest observation summary for Duwamish UPS-Freight nest site.? UPS-Freight nest was occupied and active (eggs laid, low Inc posture observed on 5/11/17 but no activity at 100% nest on 7/28/17. 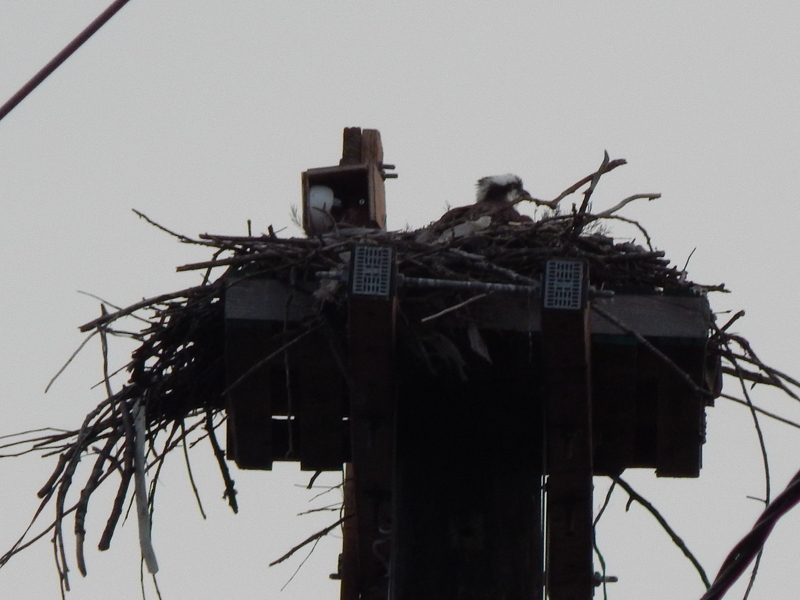 Power pole used as preferred perch located just SW of nest was removed during land restoration work. Some Osprey nests have fledged young already, however clutch completion dates for a typical Osprey population often vary by 30 days. Thanks for keeping tabs on our local Osprey nests!